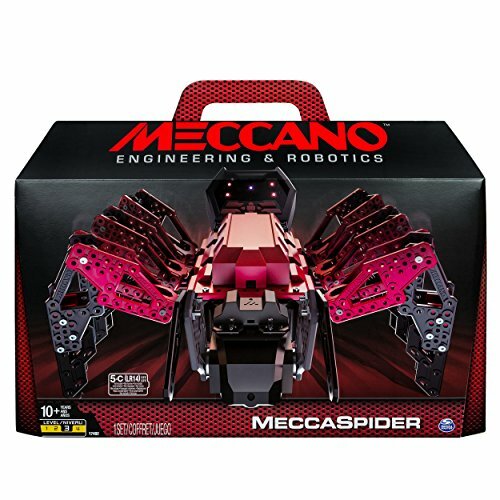 Are you searching for robot kits for kids? If so, you’ll be pleased to know that we’ve researched the top options that are available and reviewed them below. We’ve taken care of the hard part – all you need to do is have a read through the best choices in this post and decide on the one that you think your child would have the most fun with. A buying guide section is also available at the end to provide you with additional information. 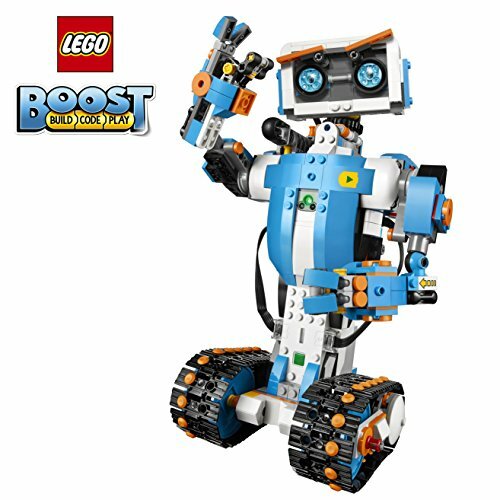 This LEGO Robot Coding Kit comes with a total of 840 pieces, which is plenty to keep your kids engaged for a while. With so many pieces available, children are able to use their creative thinking and problem-solving skills to assemble the kit. During the process, their hand-eye coordination and motor skills are able to improve greatly. Once it has been put together, kids are left with a motor, move hub, and a color and distance sensor. In addition to this, there’s a Bluetooth feature available too. This allows you to easily connect the kit to Bluetooth enables devices and download the app for some fun features to play around with. We also liked how this set can be used to make 5 different models. The color and distance sensors available with this one make it a lot of fun to play with. Building the kit is awesome for your child’s motor skills and coordination. 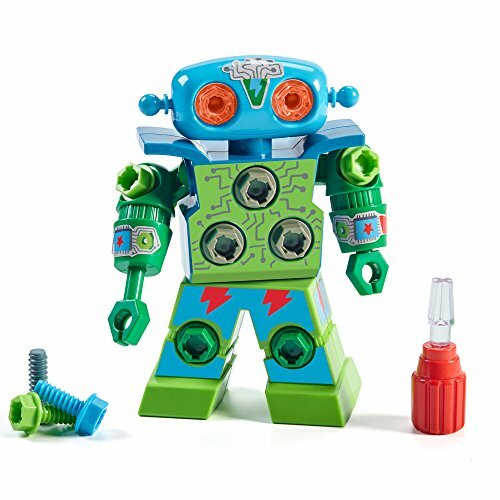 The Think Gizmos Build Your Own Robot Toys for Kids features a range of 237 pieces for kids to assemble. This is an effective way to develop their hand-eye coordination and motor skills. Not to mention, their problem-solving and creative thinking skills are given the chance to improve too. The kit comes with a remote control which kids can use to move the robot around after they’ve assembled it. 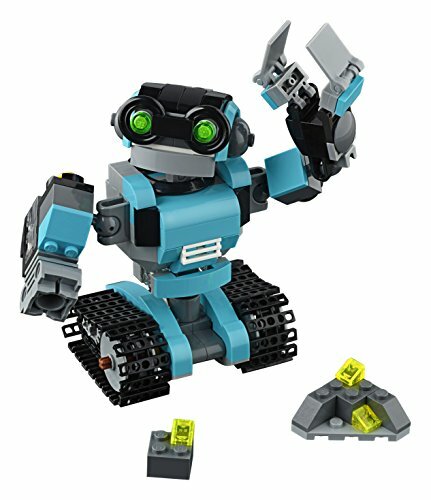 There are 4 different robots available for kids to build. So, once they’ve built and played with one for long enough, they can disassemble it and make another one. Each robot toy takes anywhere between 30 minutes and 2 hours to construct. This is an excellent way to improve your child’s patience, as well as their ability to focus for longer. Children feel a great sense of accomplishment after completing and playing with each toy. With 4 different toys available to build, kids are able to remain engaged and focused for a while with this set. Their creative thinking, motor skills, and hand-eye coordination abilities are all able to improve. This Tinkering Labs Electric Motors Catalyst STEM Kit comes with a total of over 50 parts. Therefore, children are able to be occupied for some time while constructing it. During the process, their hand-eye coordination and motor skills are able to improve. We were impressed with how there are instructions that kids can use to build a wide range of different robot toys. So, you can feel confident in knowing that they’ll be able to use this kit for a while to come. They can use it to build robot toy cars by adding other LEGO pieces and motor parts. As a result, the kit encourages them to be super imaginative, which is great for their creative thinking skills. Kids have a blast building the various robot toys available in this set. It inspires them to be more creative and develops their coordination and motor skills. The Botley The Coding Robot Activity Set by Learning Resources comes with a range of 77 pieces for kids to use and construct their toy. As a result, their hand-eye coordination and motor skills are able to improve. Furthermore, children are able to put their problem-solving skills to the test as well. The kit comes with detachable robot arms, as well as 40 coding cards. Therefore, it’s an awesome set for helping your kids to learn about the basics of coding from a young age. It’s highly educational and cognitively stimulating. We were impressed with how the toy comes with smart logic technology built-in. This enables it to detect objects as well as tackle obstacle courses. This is an excellent kit that teaches kids about coding, while also developing their motor skills and problem-solving abilities. This Educational Solar Robot kit comes with an incredible 14-in-1 feature. Kids are able to use the set to create up to 14 different robot toys, which keeps them entertained for hours on end. It encourages them to be more creative and helps to develop their hand-eye coordination and motor skills. As kids are building the different toys available, they’re given the opportunity to learn more about how solar energy works. So, it’s a highly educational set, that’s also exciting. The solar power function is awesome as it enables the toy to function without requiring batteries or being recharged. It also comes with a feature that enables it to work in water and on the land. There are toys that can crawl or walk on land, and there are others that can float in the water. Children are able to learn more about solar energy due to the hands-on approach that this set involves. Their hand-eye coordination and motor skills are also able to develop. 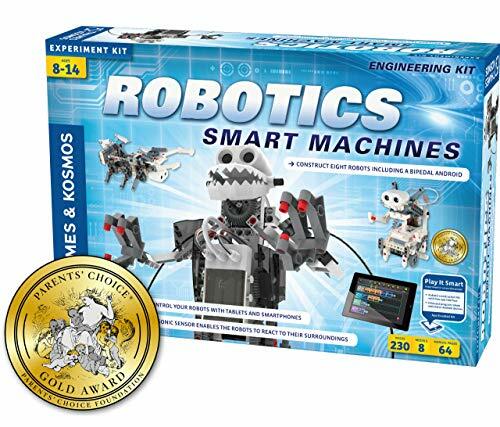 The Thames & Kosmos Robotics Smart Machines Science Kit allows kids to build a total of 8 different robot toys. Therefore, you can feel confident in knowing that your children will have a blast using the set for a while. Building the different toys is excellent for developing your child’s motor skills and hand-eye coordination. It can be connected to a smartphone where you can use the app to program the robot to control what you want it to do. This is something that kids have a blast with. It’s also great for teaching them the basics of how programming works. The instructional manual that’s available is super easy for kids to follow and use on their own. This is a result of the colors and illustrations that are available. This is an awesome set for helping kids to learn about programming, while also developing their motor skills and coordination. 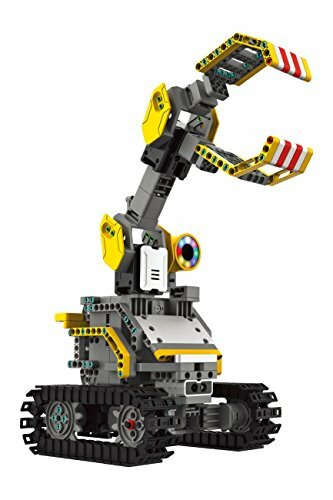 The Meccano Erector Set Robot for Kids comes with a range of 291 parts and takes around 1-3 hours to build. As a result, you can expect your kids to use their motor skills and problem-solving abilities to complete constructing this one. It features a couple of hand tools, a decal sheet, and instructions. During the building process, kids are given a challenge, which is great for stimulating their cognitive thinking abilities, as well as their creative thinking skills. Children feel a great sense of achievement when they complete building this one. They also love to involve other people to help out. Therefore, it can be great for improving their social skills and abilities to work in teams. There are different programmable modes available, which include things like attack mode and guard mode, which are a lot of fun to play with. This kit is more difficult for kids to build, which means that they’re likely to need some help. As a result, their social skills and teamwork abilities are able to improve. 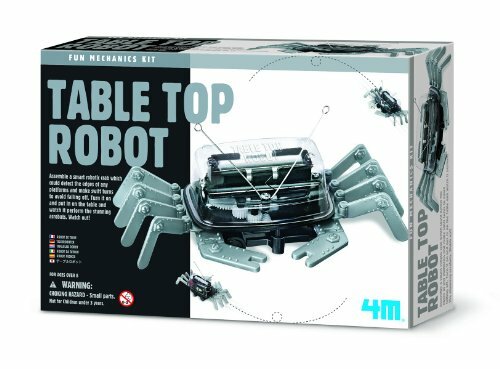 The 4M Table Top Robot provides kids with a hands-on approach to learning about how robotics work. They have a blast constructing the robot toy – it also develops their hand-eye coordination and motor skills. Once the toy has been assembled, it can be activated to move around on its own. We were impressed with how it can detect objects that are blocking its path and move out of the way. It can also perform a range of tricks which are fun to watch. Children have a ton of fun with this toy and it inspires them to be more imaginative and improve their creative thinking skills. They love involving other people to help build the toy and play with it afterward too, which is awesome for their social skills. 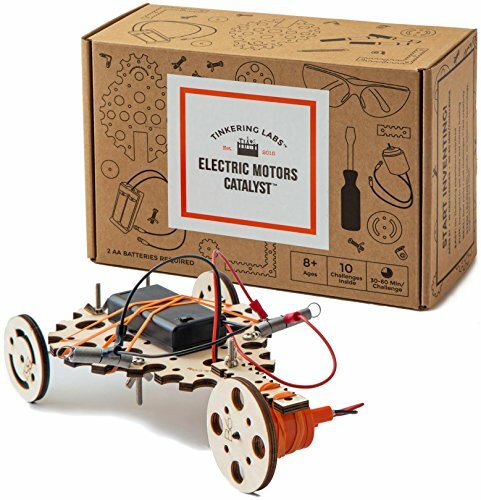 This is an educational set that teaches kids about robotics, while also enabling them to have fun and develop their motor skills and coordination. 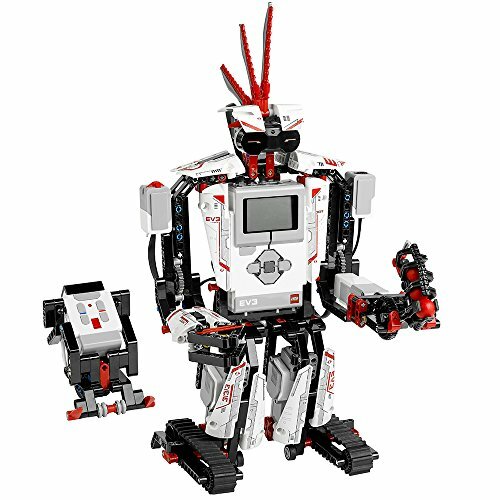 This LEGO Mindstorms EV3 Robot Kit features a total of 60 pieces, which provides kids with plenty of parts to remain busy with assembling for hours. It’s a great way for them to develop their motor skills and hand-eye coordination. We liked how it comes with touch, color, and IR sensors as it provides kids with a lot to observe. There’s also a remote control available that enables kids to control the robot. They can make it move around, talk, shoot targets, and grab things. We were impressed with how it has a range of 17 different possibilities for children to play with. Therefore, you can eb sure that they’ll be entertained for a long time. Kids are also given the opportunity to learn about coding. This is because the toy is controlled via a programmer, which children can use by downloading the app. So, it’s fun and educational! This is an awesome kit that kids have a blast building and playing with for hours. It’s excellent for teaching them about programming in an exciting way. This UBTECH Builderbots Kit Interactive Building Block Set features a range of 357 pieces which have a snap-together function. Therefore, kids are able to easily put all of the pieces together while developing their motor skills and hand-eye coordination. When the robot toy has been assembled, it has an LED light, infrared sensor, and 4 robotic servo motors. Kids have a blast controlling the robot by programming it and watching how it reacts. This is an awesome way to teach kids about the basics of programming. They can program the robot toy to pick things up and move around obstacles that are blocking its path. This encourages children to play and think with more creativity. Kids have been loving using this kit to learn about programming while also having a lot of fun in the process. This Robo Explorer Robot Toy by LEGO has a fantastic 3-in-1 feature. Therefore, kids are able to have a blast building and playing with 3 different robots in this one set. They can make exciting toys, such as a robot dog that comes with a jet-pack that lights up. We found this set to be an effective way to help kids develop their ability to be more imaginative, which is great for their creative thinking skills. Furthermore, we were impressed with how interactive the toys are. Their eyes can light up and their bodies can move around freely. As a result, kids feel encouraged to play with it for hours and have a lot of fun. 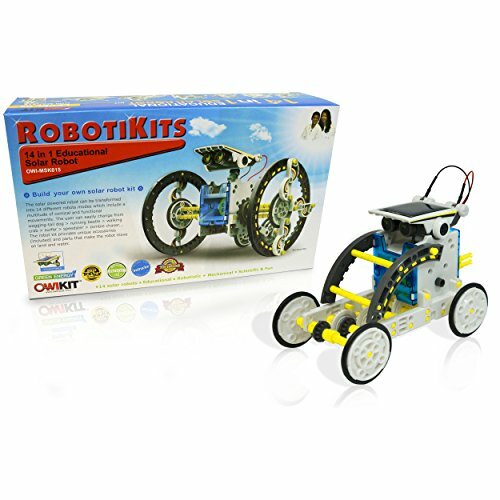 Kids have a lot of fun playing with the different robots available in this single kit. It helps them to think more creatively and have a blast. The Makeblock Starter Robot Kit comes with 2-in-1, which enables kids to build and play with different toys. Children are given the choice to build either a 3-wheeled robot car, or a robot tank. So, when they’ve built and played with one, they can move onto the other. It’s a great way to develop their hand-eye coordination and motor skills. Furthermore, they’re encouraged to play with the toys in more imaginative ways, which is awesome for their creative thinking skills. We also liked how it comes with a graphical programming system which can be used on laptops and computers. It provides kids with the opportunity to learn about programming in an exciting way. 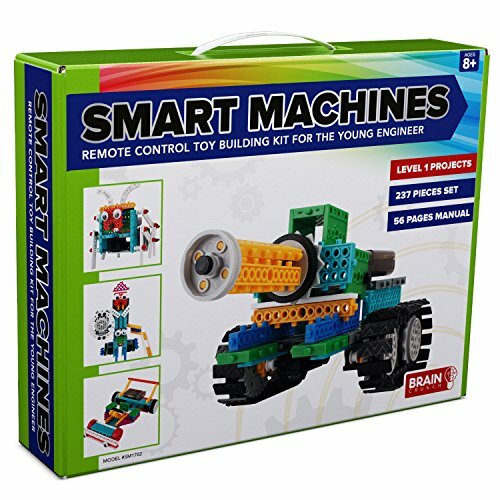 This is a fantastic set that helps kids to think more creatively and learn about how programming works. 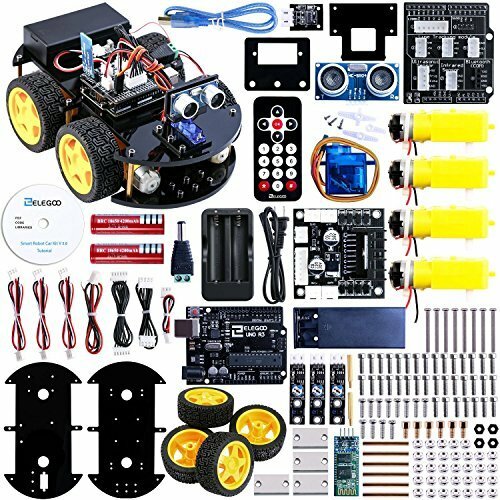 This ELEGOO UNO Project Upgraded Smart Robot Car Kit is a fantastic set for beginners. It provides kids with a hands-on approach to learning how to code and discover more about electronics. Therefore, it’s highly educational. We also liked how it encourages children to build things and develop their hand-eye coordination and motor skills. Not to mention, their creative thinking abilities are improved during the process too. There are 24 different module parts available. These are what the toy uses to perform various functions, such as moving around obstacles. You can also download an app for kids to use and control the robot with. Children have a lot of fun playing with this kit and learning about programming, while also improving their creative thinking skills. The Design & Drill Robot by Educational Insights is a fantastic choice for younger kids. This is because it comes with a range of pieces that can be easily snapped together. Children can then use the colored bolt pieces and safe screwdriver to drill them in. We found this to be a remarkably fun experience for kids that helps them to develop their motor skills and hand-eye coordination. It’s also effective at improving their problem-solving abilities. The kit also comes with a range of stickers. Kids have a blast using this stickers to decorate their robot toy, which is awesome for their creative thinking skills. The tools that are available with this kit are great for peaking your child’s interest in engineering. Younger kids have a lot of fun playing with this set and developing crucial skills, such as their motor skills and hand-eye coordination. This STEM Toy Making Set comes with a total of 4 models in one. Therefore, kids are provided with plenty to play with and be entertained for hours. Each one of the toys takes between 30 minutes and 2 hours to construct. The building process is excellent for your child’s motor skills and hand-eye coordination. The instructions that are included are available in color and have diagrams to make it easier for kids to construct the toys. As a result, they’re able to play with the toys independently. Building these sets also teaches kids about how to focus for longer periods of time. Their ability to follow instructions and think logically is improved. Not to mention, these toys encourage children to think more creatively. This is a fantastic set that enables kids to spend hours on end building the various toys and developing their ability to think more creatively. 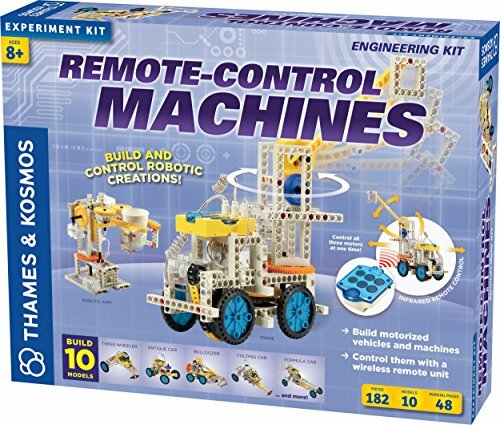 The Thames & Kosmos Remote Control Machines set provides children with the opportunity to build up to 10 different models with one kit. Therefore, you can feel confident in knowing that your kids will be able to play with this set for a while. Constructing all of these different models is excellent for your child’s motor skills and hand-eye coordination. It also encourages them to play with more imagination, which is great for their creative thinking skills. There are 3 motors available which can be used in the different vehicle and machine toys. So, kids are able to experiment with how they use these motors depending on the toy that they’ve made. Children are able to be occupied for hours on end when playing with this set because of how it includes 10 different models in one. 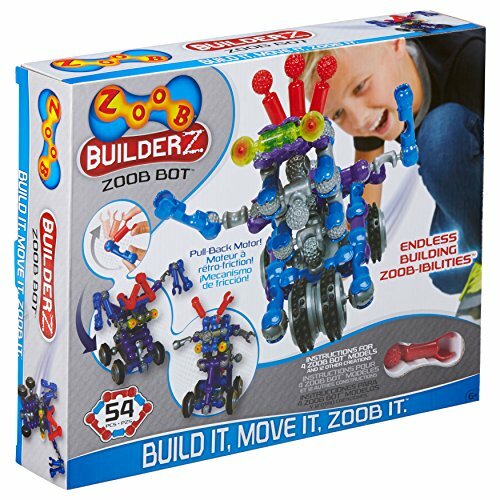 The ZOOB BuilderZ ZOOB Bot set is a fantastic beginners set for kids. It introduces them to robots and teaches them about electronics in an exciting way. It comes with a total of 49 pieces which kids can use to assemble and develop their motor skills and hand-eye coordination. These pieces include 2 wheels, a ZOOB piece that lights up, a 2-wheeled motor, 4 tires, and more. Therefore, there are a lot of parts for kids to assemble and be engaged for hours. It’s awesome for improving their ability to focus. We also liked how it features a pull-back motor feature. Children have a lot of fun pulling the robot toy backwards and watching how it moves off forwards. It’s a great way to improve their ability to play and think more creatively. We liked how this robot toy kit enables children to develop their motor skills and coordination, while also learning more about electronics. 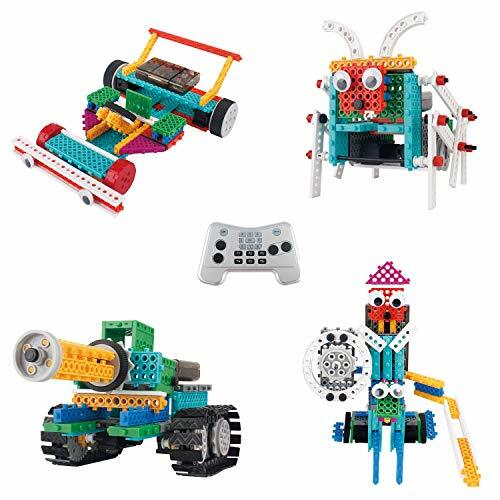 Now that you have a better understanding of what the top build your own robot sets have to offer, you can begin narrowing down your search to finding the one that you think will suit your child the best. If you still aren’t feeling 100% certain on which one to pick, you’ll want to have a read through this buying guide section. We’ve included information on the different types of kits available, the various brands, as well as which ones we recommend for kids and teens. After reading through the robot making kits above, you will have noticed that there are a variety of different kinds available. If you were interested to learn more about the different types, take a look below. There are a few kits that are specifically made for beginners. We recommend these sets to younger kids or those who have no experience with building or robot toys. They are designed as a way to introduce kids to these kits. Therefore, the instructions are generally easy to follow and they aren’t too difficult to assemble. The advanced kits are the ones that tend to have more pieces or a wider range of models available to build in one set. They provide kids with more to do, which means that they are more challenging. These ones may be best for kids who want to play with the set in groups or who are slightly older. With more pieces available to construct, kid are able to put their problem-solving skills to the test. We’ve included a number of programmable kits in this review because of how educational they are. Children have a lot of fun building and playing with the sets, which encourages them to want to learn more about how programming works. They’re able to program their robot toys to do different things. Therefore, it’s a very hands-on approach to learning that kids have a lot of fun with. 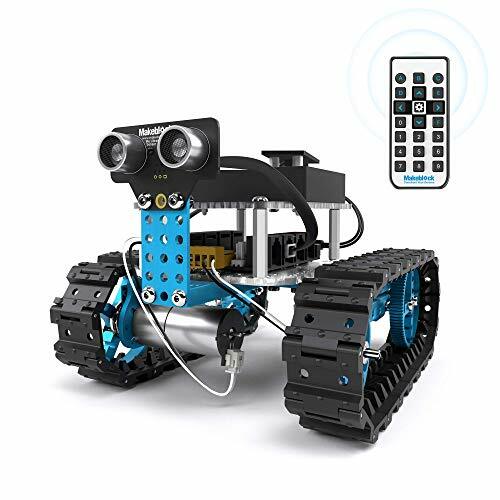 Remote control robot toys for kids are a lot of fun as they enable them to build and control their toys. It’s highly interactive and allows kids to have fun controlling their toy for hours on end. There are a number of top brands that manufacture robot toys that we have mentioned in this review. If you wanted to learn a little bit more about each of these companies, take a quick look at the section below. STEM Robotics is focused on helping kids to learn more while playing with their toys. STEM stands for science, technology, engineering, and mathematics. Therefore, the toys that they make are awesome for educating kids on these topics, while also ensuring that they have fun doing so. As a result, they feel more encouraged to continue to learn. Makeblock are another great brand that creates toys for kids that are both incredibly fun and educational. They were founded in 2013 and have been implemented in schools as a way of providing kid with a deeper understanding of education and technology. Lego is a very well-known brand that is known for manufacturing high-quality toy sets, and their robotic sets are no different. Their sets come with a range of pieces that require kids to use their hand-eye coordination and motor skills to assemble. We also like how the Lego sets encourage children to play and think with more creativity. Learning Resources is a brand that has been around since 1994 and they make high-quality toys that help children to learn and have fun. Their toys are often used in schools due to how effective they are at helping children to learn. They understand how to combine fun and education, and that’s why their toys are so effective for kids. Educational Insights is another brand, just like Learning Resources, that understands how powerful their toys can be at helping kids to learn by making them exciting. The playful nature that they implement into all of their toys makes the learning experience a lot more enjoyable for kids. We also like how their toy range inspires children to play with more imagination and develop their creative thinking skills. Depending on the age of the person that you’re looking to buy a robot set for, there are some things to consider. To learn more about how to select the best kit based on the age range of the child who you’re buying it for, take a look below. 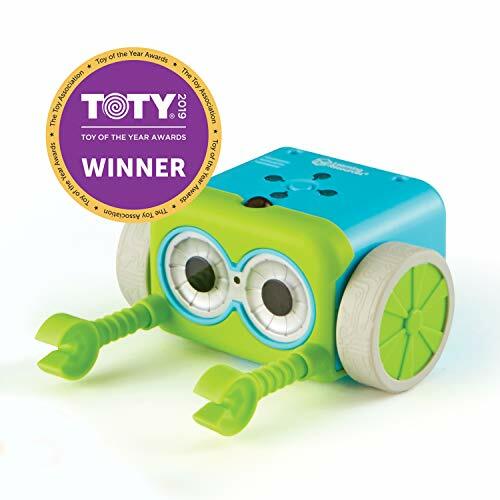 When it comes to finding a kit for kids ages 5 – 12, we recommend one like the Learning Resources Botley the Coding Robot Activity Set. These kinds of sets are great for kids as they come with enough pieces to still be a challenge, without being too overwhelming and difficult. Something that has educational value to it would also be a great idea for kids. The 14-in-1 Educational Solar Robot is a fantastic option for teenagers due to the fact that they’re able to make up to 14 different models in one set. So, sets that are more difficult and provide more to do are best for teenagers. It keeps them more engaged and challenges them enough to learn new things. So, that wraps up our review on the best build a robot kits that are currently available. Be sure to read through the main features of each item, as well as the pros, cons, age recommendation, and what makes each one stand out. That’s what will provide you with the best idea of whether or not you think it would be the best choice for your child. Our buying guide section also ensures that you have more information to help you feel completely confident about your final decision.